New Jersey's weather over the next 48 hours will be very dynamic and interesting, as the temporary warmup ends and colder air returns. Thursday looks like a pretty typical April day! The problem, of course, is that the calendar says January! Additionally, this will end our welcome weeklong warmup, as colder air returns by the weekend. High temperatures will reach 60 degrees or better across most of New Jersey on Thursday. (And those that don't - mainly in North Jersey - will still top out in the mid to upper 50s.) That's at least 20 degrees above normal for this time of year. And very close to record highs. Records for January 12 are 61 at Newark, 68 at Trenton, and 63 at Atlantic City. It's not a perfect day, though. We had a batch of steady rain push through the state early Thursday morning. Thick clouds and scattered showers/sprinkles are expected to stick around for much of the day, especially in North Jersey. Winds will be brisk, out of the southwest up to about 20 mph. So skip the winter coat, and go with a lighter jacket. Maybe an umbrella too. The leading edge of our next batch of cold air (i.e. our next "cold front") will arrive early Friday. The morning will remain mild, with statewide temperatures above freezing. 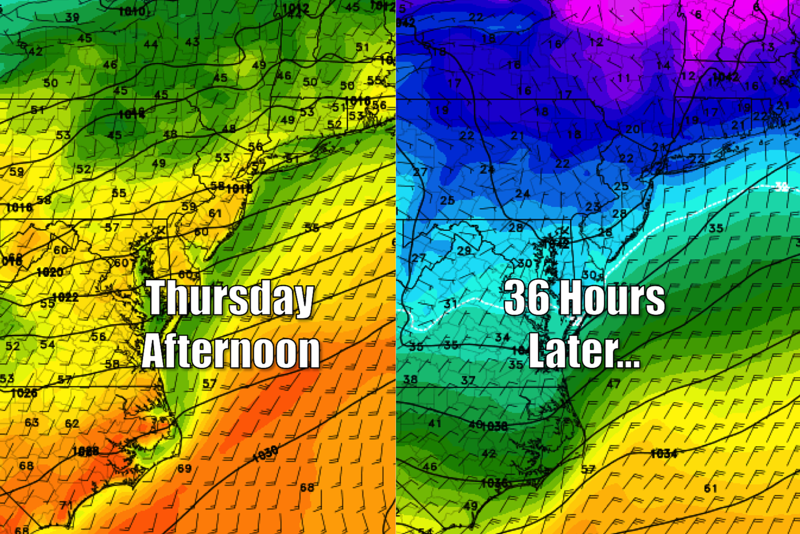 Friday evening's temperatures will be a very different story. High temperatures for calendar day Friday will occur around mid-morning - I'm thinking mid 40s to the north, lower 50s to the south. Temperatures will steadily tumble throughout the day, ending up in the 30s by Friday evening. That's going to be a big change and a very noticeable difference. I'd recommend dressing appropriately for a mild start and cool finish to the day. Our newly refreshed cold air will set us up for another cold weekend. High temperatures on Saturday will be in the lower to mid 30s. So, as our next storm system slides into the Garden State throughout the daytime Saturday, we will have a chance for some wintry weather. The trouble with this system will be temperatures. Impacts will likely range from all snow in colder North Jersey, to at least some rain in above-freezing South Jersey. So we'll call it "wintry mix" to cover all possibilities. Meanwhile, the "heaviest" precipitation is presently modeled along the Delaware River in central-southern New Jersey, in the neighborhood of Mercer-Burlington counties. I suspect that will be the "sweet spot" with the most wintry (wintry-est?) impacts overall. Bottom line for Saturday... A period of wintry mix throughout the entire day may make things a bit slippery in spots. However, this is not going to be a major winter storm. An inch or two of slushy accumulation is possible. By Sunday, skies will clear and temperatures will warm to a seasonable 40 degrees. Even warmer temperatures are in the forecast through midweek next week.